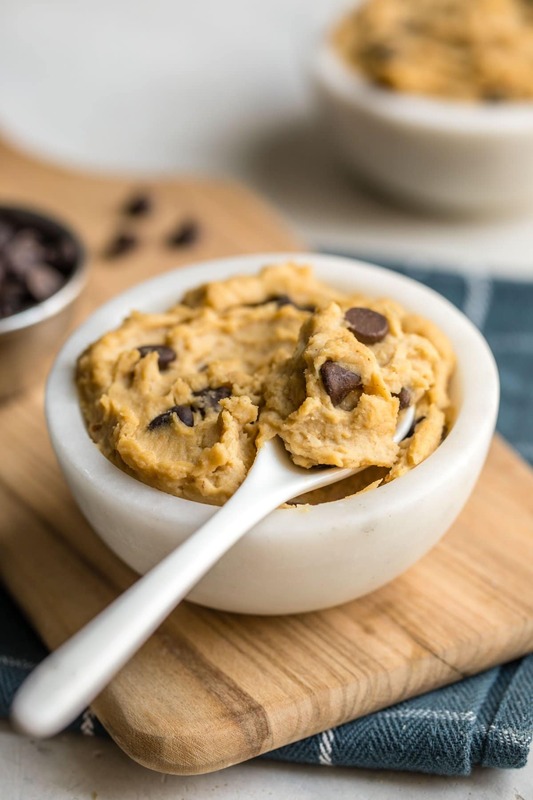 This Chickpea Cookie Dough is made from wholesome ingredients, but will still satisfy your sweet tooth! Plus it’s Vegan, Grain-Free, and Refined Sugar-Free. 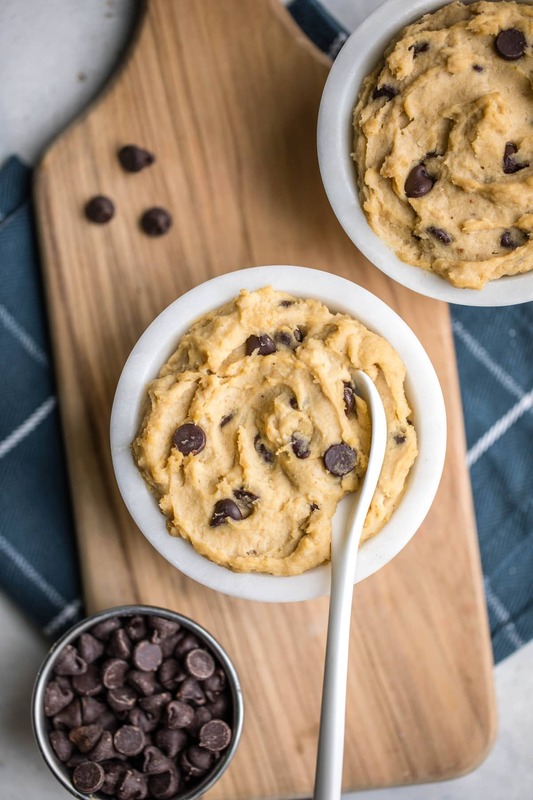 Chickpea Cookie Dough. Yep, you heard me! 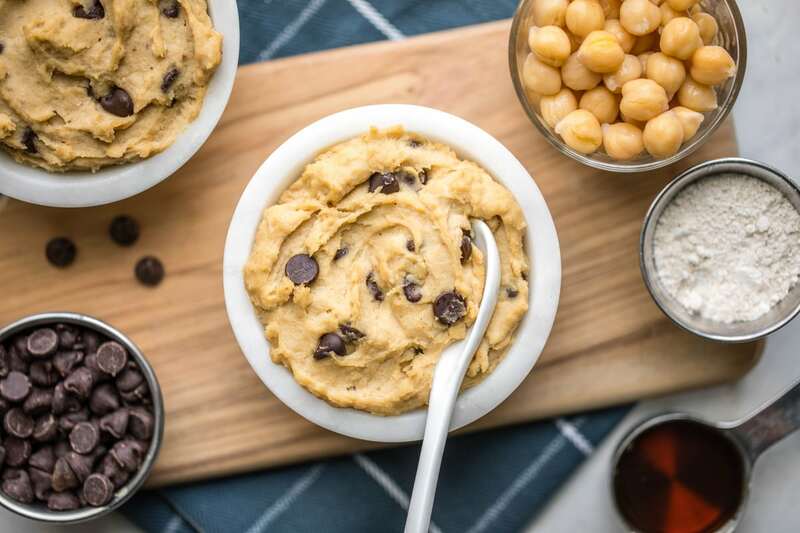 Who knew that pureéing Chickpeas with 5 other healthy ingredients would result in a thick, cookie dough-esque batter that tastes like dessert, but is also loaded with fiber and plant protein?! I certainly did not, but now I do. And this stuff is so dang good, I just had to share the recipe with you! And while the latter is still kind of true…I’m okay with it. 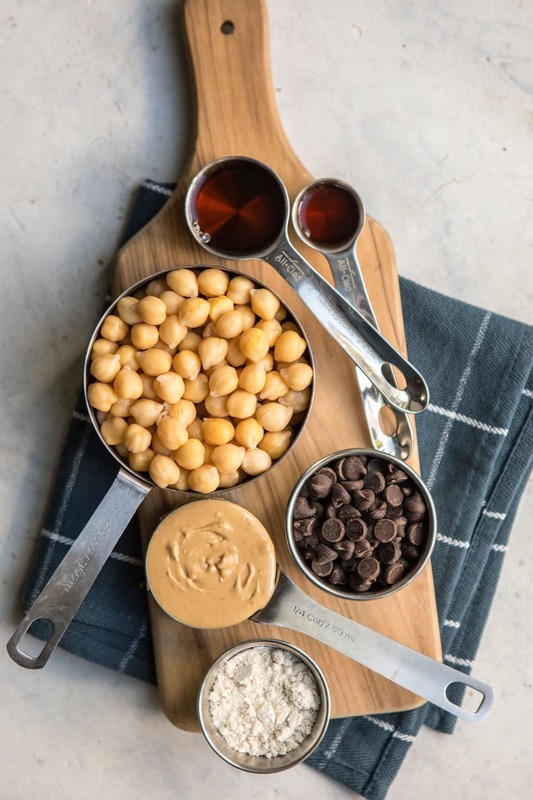 Because somehow the combination of Nut Butter, Vanilla Extract, Oat Flour, Maple Syrup, and Chocolate Chips totally masks the flavor of Chickpeas. And I’m not going to complain about that, that’s for sure! I know many of you are Grain-Free, Nut-Free, or avoid eating certain Sugars, etc. Don’t worry — I’ve got you covered. I tested this recipe using as many substitutions that I could think of, and included all of them in this blog post for ya! 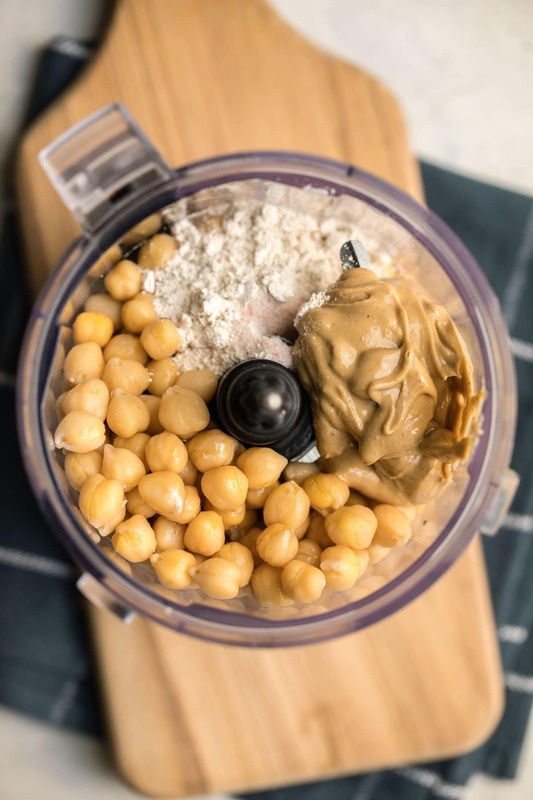 Nut Butter: You need to blend the Chickpeas with some kind of healthy fat, otherwise the final mixture won’t be as creamy or smooth. I prefer to use Cashew Butter, but any will do – it comes down to personal flavor preference. Flour: Finally, you need some sort of “flour” to help thicken the puree and make it more fluffy and dough-like. I tested this recipe using both Oat Flour and Almond Flour (for my Grain-Free) friends, and liked both equally! The Oat Flour has a more Cookie-like flavor and was slightly thicker, while the Almond Flour gave an extra creaminess to the batter. Sweetener: I’ve seen Chickpea Cookie Dough be made with both Dates and Maple Syrup, so I tested both. Honestly, I couldn’t tell the difference between the two in terms of smoothness or flavor! As long as you soak your Dates beforehand they should blend well into the mixture. For reference, the top Cookie Dough was made with Dates and Almond Flour, while the bottom was made with Oat Flour and Maple Syrup! As you can see, they both look pretty similar, aside from some small brown flecks in the “batter” made from Dates. 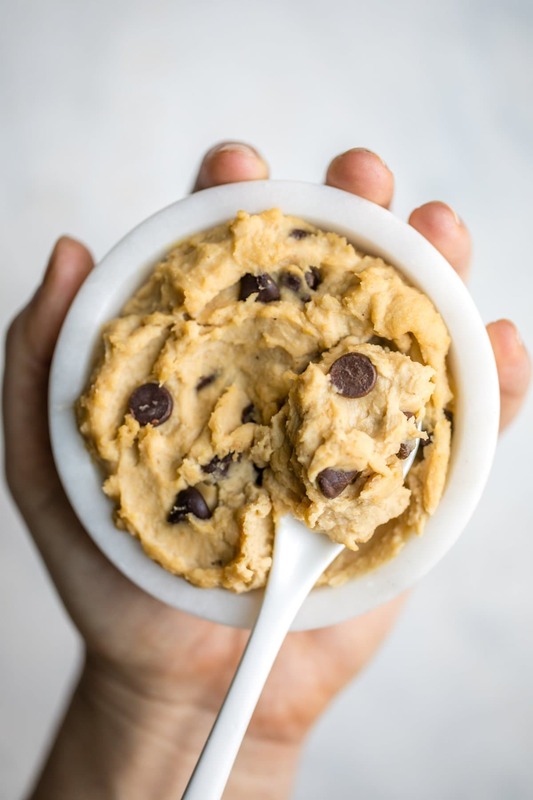 Not only do I love that this Cookie Dough is made from wholesome ingredients, but I also equally love the fact that its sole purpose is to be eaten “raw.” And because there’s no eggs or dairy in it, you don’t have to worry about an upset tummy! I’ve never tried to bake this recipe, and I wouldn’t suggest it. Maybe that’s a project for another day, eh? I tested this recipe using both Pressure-Cooked Beans (from my Instant Pot) and Canned Beans, and noticed that the Canned Beans tastes a lot more bean-y than my homemade ones. If you have the option, I would go with homemade! Want to get fancy? Don’t just stop at Chocolate Chips! 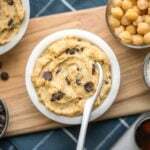 This Chickpea Cookie Dough would also be yummy with Pretzel Pieces, chopped Nuts, or even pieces of Dried Fruit. This Cookie Dough will keep well in the fridge for up to one week…I doubt it will last that long though 😉 I have not tried freezing the leftovers, but don’t imagine that would end well. If you’re looking for more healthy Vegan Dessert recipes, you’ll also love this Almond Butter Brownies and these Blueberry Crumble Bars! Add all ingredients, except for the Chocolate Chips, to a high-speed Blender or Food Processor. Process until a thick, even dough forms, scraping the sides of your device as necessary. Keep in mind that the dough will thicken even more after the flour absorbs some of the liquid and after it sits in the fridge. Taste the dough and add more Sweetener, if desired. Transfer the dough into a large bowl and use a Spatula to fold in the Chocolate Chips (or just pulse them in using your blender). Serve and enjoy! Leftovers will keep in the fridge for up to one week. 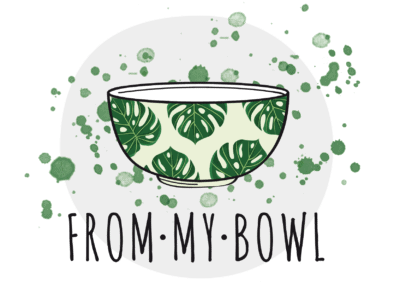 A note on Chickpeas: I cooked my own Chickpeas from dry using my Instant Pot; if you are using canned beans, you’ll need about 1 can for this recipe. If you use canned beans, REALLY rinse and drain them well! I also tested this recipe with canned beans and noticed that the final dough tasted much more bean-y than with pressure cooked beans. If you go with canned, I would suggest adding extra Vanilla Extract and Sweetener to mask that flavor. Finally, if your canned Beans have Salt in them, reduce the amount of Salt in this recipe by ¼ tsp. Nut Butter: The Nut Butter you use will affect the final flavor of the Cookie Dough. Cashew Butter is my favorite, though Almond/Peanut Butter or Tahini are also yummy! If your Nut Butter is salted, reduce the Salt in the recipe by ¼ tsp. 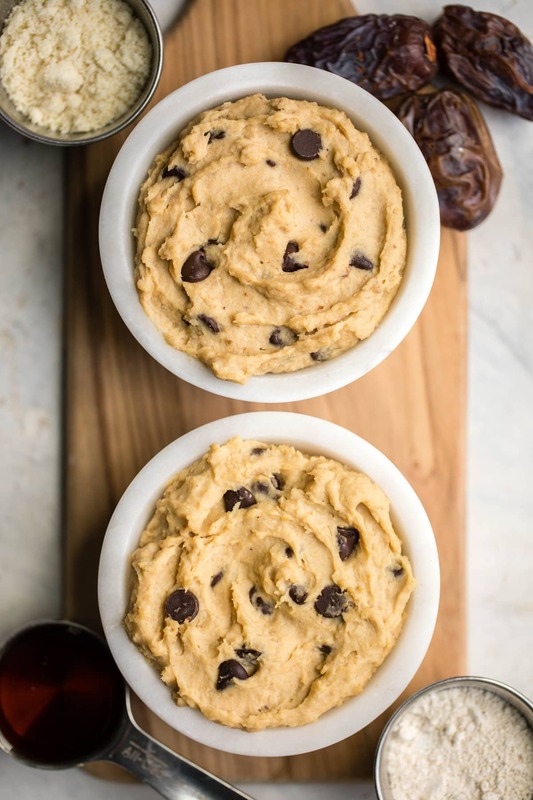 I’m definitely going to try this because I’ve been seeing chickpea cookie dough recipes exploding everywhere lately, so I want to make some for myself. But the question is…COULD they be baked? 😁 For the sake of my husband who hates cookie dough but loves cookies, I’m curious if you experimented with that. Thank you so much for providing an option with dates! I dont think these could – I will have to work on a baked chickpea cookie recipe for the blog too! Wow this sounds great! Thank you for all of the substitutions. I’m sure that was a lot of work. Can’t wait to try this. Do you think if I took the skins off of the canned check less it would taste less bean-y? Maybe even cooked them a little? Can this recipe be baked into actually cookies? It looks delicious Caitlin! No, I dont think it would work out! This looks SO good! I think I’ll try to cook up some chickpeas for this recipe. I had no idea that the canned beans made it more beany. It does make sense though. I also love that you added substitutions because I can make it nut free and pack it for school. Thanks for another delish veggie friendly recipe! Yum! Thanks so much for this heathy take on an otherwise very interested junk food! Who would have guessed that chickpeas would be this versatile? You are a genius! 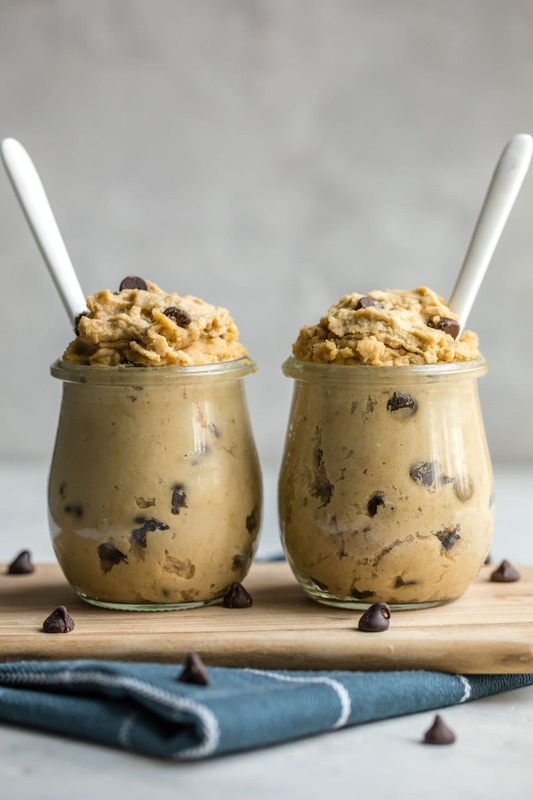 This is everything I could dream of–cookie dough is something I have been craving for the longest time! I could seriously spread it on everything and eat it by the spoonful. This recipe is so freaking perfect and easy–I would love to try making it one day! Thanks for sharing! Does the chickpea flavor com through much? I saw your Quinoa & Arugala salad was posted in Wholesome Culture’s site and came over to check out your page. This recipe blew my mind. I am always on the look out for new inventive vegan recipes and this one is gold.